Firefighters with Douglas County Fire District No. 2 responded to two working structure fires Tuesday evening. 18 total firefighters responded to the two fires with 5 fire engines and assistance from Winston Dillard Fire District No. 5. The fires were both extinguished quickly preventing significant losses. 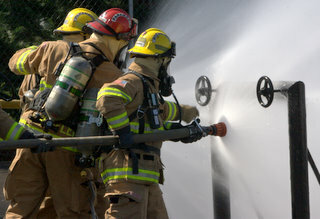 The first structure fire occurred at 8:26 P.M. at 3055 Porter Street in Roseburg. First arriving fire engines reported light smoke coming from the attic area. After investigation firefighters discovered that the attic was involved with fire. 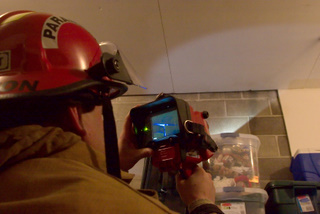 Personnel extended hose lines into the attic space and extinguished the fire. Firefighters had to remove some sheetrock below the fire to expose the roof rafters and fully extinguish the fire. Personnel remained on scene for two hours. Pacific Power and Light also responded to disconnect the power to the structure. No Damage estimate is available at this time. The cause is still under investigation. The home is owned by Gregory Orton of Roseburg. The Second structure fire was reported 11 minutes after the Porter Street fire and was located at 670 Glengary Loop in the Green area. First arriving firefighters found a two story home with a garage on fire. Firefighters quickly extinguished the garage fire and focused on making sure the fire had not spread into the ceiling area above the garage. Firefighters determined the fire had not extended beyond the garage. 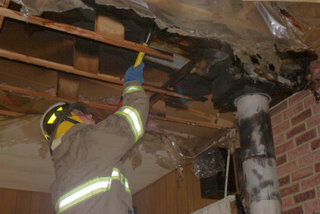 Sheetrocked walls and ceilings prevented the fire from spreading to the rest of the home. Firefighters remained on scene for two hours cooling smoldering debris and assisting fire investigators. Winston Dillard Fire District No. 5 also responded to the Glengary Loop fire. Eight Firefighters responded to the fire with three engines and one incident commander. The home was owned by: Ronald Groves and was occupied by Joe, Bogan. The fire caused an estimated $ 30,000 damage to the building and $10,000 damage to contents. Firefighters with Douglas County Fire District No. 2 responded to a reported flue fire Thursday at 1:03 P.M. The home was located at 214 Timberlake Ave. in Roseburg. The home was owned by Rigoberto Herrera and Candace Mock. 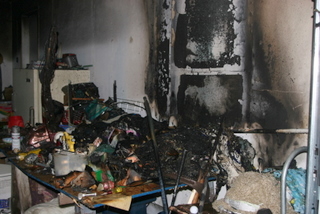 The fire caused and estimated $8,000.00 in damage. Prior to the first fire engine arriving at the scene, the homeowner called back and advised that the fire had spread from the chimney and was now coming from the roof of the home. First arriving firefighters found a double wide manufactured home with light smoke coming from the building. Further investigation revealed a fire was burning in the attic space around the stovepipe. Firefighters extinguished the fire and then removed the ceiling and insulation around the pipe to make sure the fire did not extend. 12 firefighters with three engines one ambulance and three command staff responded to the fire. The fire was placed under control 13 minutes after the first engine arrived at the scene. Flue fires commonly spread to walls and the attic area of homes. Flues can deteriorate over time letting a tremendous amount of heat escape during a flue fire. If wooden rafters in the ceiling or roof are in contact with the flue, the wood may catch on fire. Homeowners should have their flue inspected and cleaned annually and burn only dry wood. 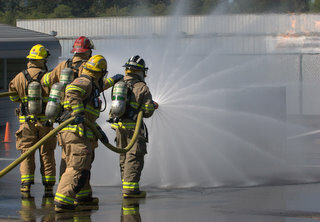 The Oregon Department of Public Standards Safety and Training (DPSST) is providing the training as part of its statewide training program. 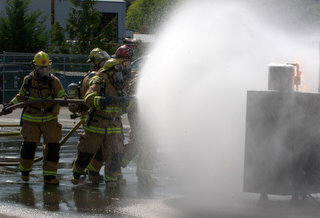 Firefighters will extinguish fires that simulate a flammable liquids fire, a gas meter fire, pipeline fire, a large propane tank fire, and a tanker Firefighters will work in teams of 5 firefighters that approach the flaming props and turn valves off to stop the leaking gas. Firefighters will be wearing full protective clothing and self contained breathing apparatus. Most people have some type of flammable gas in their homes. Whether it’s a propane tank for a barbecue or acetylene gas for a cutting torch. These gases can violently explode when exposed to fire. Firefighters need to be aware of the hazards and trained in the proper precautions to take when dealing with these products. 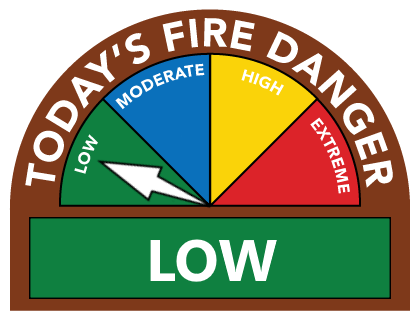 • Open fires must be limited in size, be controlled, and not be a hazard to people, property, or standing vegetation. • No pile of burn material may be larger than 10 ft. x 10 ft. x 10 ft. without a special burn permit. A minimum of 25 feet. clearance from other combustibles or structures is required. • Combustibles should be removed from around burning piles that would contribute to the spread of fire. A minimum 10 feet. wide firebreak down to mineral earth must surround each burn pile. • A garden hose connected to a water supply and a shovel or other approved fire extinguishing equipment shall be readily available. • Burning material shall be constantly attended by a person knowledgeable in the use of the fire extinguishment equipment. An attendant shall supervise the burning material until the fire has been extinguished. • Burning of materials in any manner where smoke or flame damages or endangers people or property is prohibited. • Regardless of permit, no person shall ignite, maintain, or continue to burn when conditions develop that would cause the fire to spread (e.g. high wind, brands or embers flying away from the burning site, etc. ), or when an announcement is made that there shall be no burning. • Burning shall be conducted during day light hours only (between 07:30 a.m. and two hours before sunset). All fires shall be extinguished and smoke free two hours before sunset unless otherwise specified by the prescribed burn hours on the permit or the Burn Information Number (541) 673-5503. Garbage, paper, plastic, rubber, wire insulation, asphalt, cardboard, construction debris, auto parts, asbestos, petroleum products or treated materials, plaster, rubber products, tires, animal remains, materials which normally emit dense smoke or noxious odors, slash from commercial land clearing, burning of uncut or standing vegetation, any treated wood products including plywood, particle board or any composite wood products, root wads or stumps, materials transported from another location for the purpose of being burned. Heating is one of the leading causes of home fires during the fall and winter months (October through February). Most reported home heating fires involve portable and fixed space heaters and their associated equipment, such as baseboard heaters, fire places, wood stoves, gas furnaces and chimneys. Douglas County Fire District No.2 fire fighters would like to encourage every one to keep their family safe and warm by taking just a few simple safety precautions that can prevent home heating fires from spreading beyond the equipment of origin and posing a serious threat of death and injury to household residents. Baseboard heaters are very efficient, but they must be used with care. Common sense and good housekeeping can prevent most baseboard heater fires. · Check baseboard heaters often and remove objects that have fallen on top or near the heater. · Keep all furniture a safe distance from haters. Never block the flow of heat. · Never permit electrical cords to drape across or on top of heaters. · Always hire an experienced electrician to perform any necessary repair work on your baseboard heaters. · An automatic shut-off device. · A seal of approval from an independent testing laboratory like Underwriter Laboratories (UL), indicating that it has met basic safety standards. 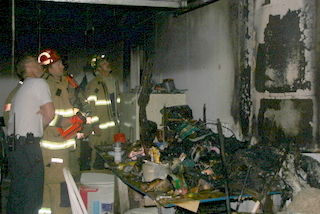 · Keep portable heaters three (3) feet away from anything that can burn. · Always place portable heaters of flat surfaces. · Always turn the heater off when you leave the room or go to sleep. · Avoid using household extension cords with portable heaters, if you must use an extension cord, make certain that it is a heavy-duty cord, and that you unplug it when you leave the room. If you use a fire place or woodstove to heat your home install them in accordance with the manufacturer’s instructions, and as required in applicable building and mechanical codes. · Always use a fire screen to contain sparks and protect children and adults from burns or accidental clothing ignition. · When burning fire wood in fire places and wood stoves, use well-seasoned wood that has been dried for at least six (6) months to a year and stored in a dry, well ventilated location. · Never burn garbage in your fire place or woodstove. · Make certain anything combustible is kept a safe distance from the fire place. · Never leave a fire unattended, especially in areas used by children or pets. · Clean out the fire place ashes when cool and dispose of them in a metal container. Gas furnaces provide efficient and clean heating in a large number of homes in most communities and require very little maintenance. · Replace furnace filters as recommended by the manufacturer to ensure they operate efficiently. · Have your furnace inspected and serviced annually by a professional to reduce the risk of carbon monoxide poisoning due to improper unit operation. Chimneys are important equipment associated with fire places, woodstoves and gas furnaces. · Chimney linings and smoke ducts should be adequate to withstand the temperatures given off by the fuels being burned in the fire place, wood stove or furnace they serve to prevent overheating of wall or roof materials. · Have chimneys inspect and cleaned annually by a professional chimney sweep to reduce the risk of fires and carbon monoxide poisoning that could result from creosote build up obstructing the chimney. · Keep the top of chimneys clear of tree limbs and other debris. · Provide chimney caps to keep debris and animals out of the chimney.